India's Missle:4 Peace, War or Waste? India’s long–range missile test is speculated to be a threat to China. However, China and Russia with India are members of the BRICS block which frequently votes to counter US and Euro-Atlantic interests within the UN Security Council. China has to degree helped Pakistan counter India’s significant military advantage. On the other hand, Pakistan has been critical ally to US and NATO as supply route to Afghanistan and effort in the war against Al Qaeda and the Taliban. Pakistan sees India as potential foe of the Islamic country, but India has a larger Muslim population than Pakistan, (and both countries share similar cultural tastes, a passion for Bollywood as well as long history as one country until partition some 60+ years earlier). Is it getting a bit confusing? It should be as the alliances and strategic interests in South Asia are both dynamic and some might argue convoluted. India’s successful launch of missile that could reach targets with a nuclear warhead 5,000 km away has been presented with many different shades of implications for regional and global security. Is it a threat to neighbors Pakistan or China? The missile can though reach much of Europe as well as most of China. It is also fair though to ask whether India with still significant poverty, health and nutrition concerns is wasting precious resources. Is India swimming now against the tide of global history as well as the legacy of non-violence promoted by Gandhi in opting to “upgrade” its weapons program? Pakistan is the first to feel the reverberations of any Indian militarization and weapons build-up. However, India did not need a long-range missile to reach any corner of Pakistani territory-all of Pakistan is already vulnerable. Further, India already possessed a decisive military advantage over Pakistan. China has big ambitions in the “South-China Sea” that threaten land/mineral claims/territory of Malaysia, Brunei, Vietnam, Philippines, Japan, Taiwan and potentially other SE Asia neighbors (most of whom belong to ASEAN Group, but India does not). The only territorial dispute between China and India is along the Himalayan border, and that is largely dormant. On the other hand, India has been accused of bullying its more immediate neighbors as Bangladesh and Nepal particularly over natural resources and rivers. 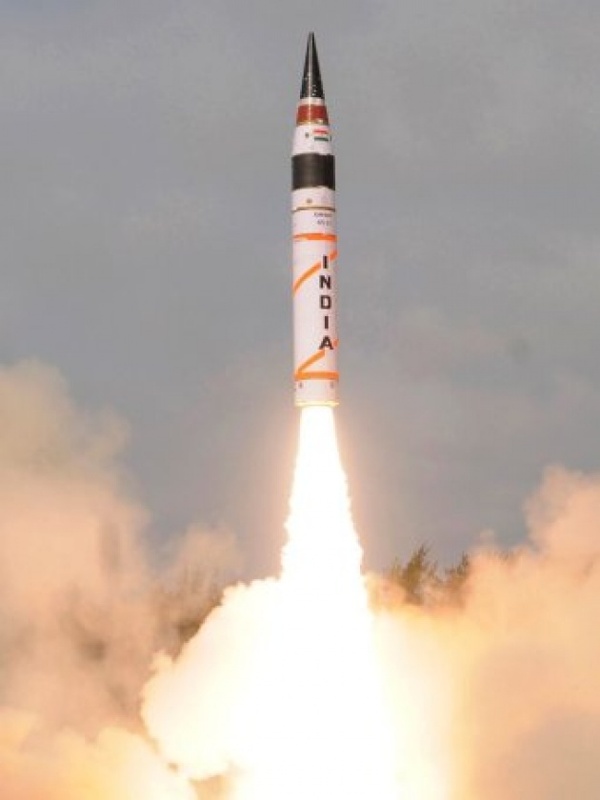 India’s upgraded missile program frankly comes at the wrong time when it remains one of the handful of holdouts in signing the nuclear test ban treaty. Another regional power, Indonesia, has recently acceded to the treaty, but China, Pakistan, US, Israel, Russia, North Korea as well as India remain holdouts. Read our Blog for Video – “Which Countries Blocking Nuclear Test Ban Treaty?” However, claiming the mantle of the globe’s largest democracy as well as the visionary leadership of Mahatmas Gandhi, India should be leading toward eliminating weapons as threat rather than looking to play catch-up with the big-powers on nuclear and missile technology. India’s example cannot be seen as positive for Iran, North Korea or immediate neighbor Pakistan. Working to eliminate nuclear weapons would be something that India would be rightfully proud of, but for now it is not on that course. See our Film for Blog – “Art for Peace-Michael Douglas”.